CFDs are similar to share trading strategies, the main difference being you only need a small amount of money up front to control your whole position. Therefore, the CFD trading strategies you look to employ should be similar to the share trading strategies you’ve been using. There is one exception to the rule relating to overnight financing charges. When trading shares, you can hold a position for as long as you like and you only pay brokerage to get in and get out. With CFD trading strategies you need to be aware of the overnight financing for holding positions long term. You will find the overnight finance will eat into your trading profits. Not by much, but they will eat into it. One great advantage of short selling CFDs is you get paid interest every day you are short, depending on the rules of your broker in terms of CFD financing. Let’s cover a brief description of each strategy. Goal: The goal of this strategy is to buy low and sell high. CFD Trading Strategy: You notice FMG is in a strong uptrend at the start of 2017, so you decide to trade in the direction of the trend. 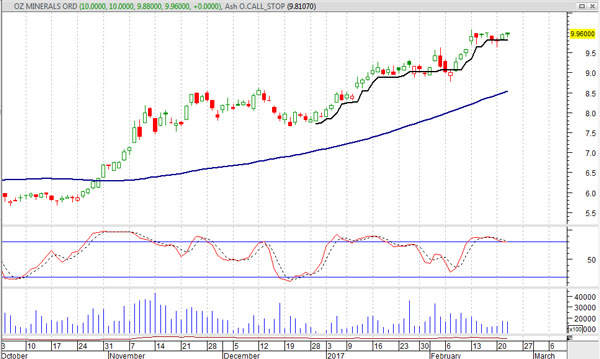 FMG started to get sold down in the midst of this nice uptrend, so you set your limit order at $6.00. You put your stop loss 2 ATR away and trail a stop behind your position. Your goal is to ride the FMG position for as long as the position keeps moving in your favour. In this case, the trailing stop is pretty close, so the time frame would be lower. If you are trading trending stocks, you could run a larger ATR trailing stop. Perhaps a 2 to 3 ATR trailing stop would work. Always test your strategies first. Timeframe: This CFD trading strategy is suited to all timeframes. The length of the trade will be determined by the strength of the trend and the distance of your trailing stop. Suited to: This is the most basic of all CFD trading strategies. It cannot get any more basic than buying low and attempting to sell high. How can you lose? If your position turns lower then you need to get out. You would lose when your long position goes below your entry price and hits your stop loss. Goal: The goal of this strategy is to sell high and buy back at a lower price. CFD Trading Strategy: In the 2nd half of 2016 and at the start of 2017, TPG Telecom shares (TPM) was getting sold down heavily by investors. After more than tripling in value the 3 years prior, TPG fell out of favour with investors. If you like trading in the direction of the trend, then TPG would have caught your eye. The downtrend is obvious. As a result, you decide to wait for overbought conditions at the start of January 2017 and open a short position by selling 1,000 TPG shares. You then trail a stop loss and wait for an exit. In this hypothetical situation, you short sold 1,000 CFDs at $7.30 and bought it back at $6.42, making a tidy profit in between. Suited to: This strategy is ideal for traders familiar with short selling CFDs. How can you lose? If your position runs higher then you need to get out. You would lose when your long position goes above your entry price and hits your stop loss. Goal: Take advantage of short-term movements in the CFD market. Short term trading CFDs can be from days to several months. It encompasses all timeframes of which most are discussed below. When it comes to trading CFDs, your CFD broker will charge an overnight financing rate. As a result, trading CFDs is often used as a short-term trading strategy. CFD Trading Strategy: Identify short to medium term trends. Using moving averages can help determine the strength of a trend. In order to find the more persistent trends, use a moving average greater than 50. Goal: Take advantage of small fluctuations in the market. One of the most widely used terms in trading. Buy the dips on confirmation of the uptrend. Use profit targets or trailing stop losses. 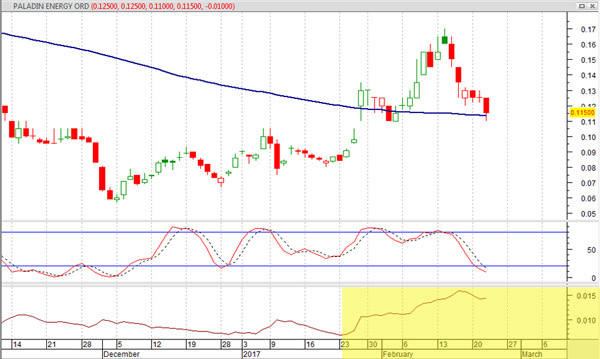 CFD Trading Strategy: You will notice the stock Oz Minerals (OZL) in the chart below. 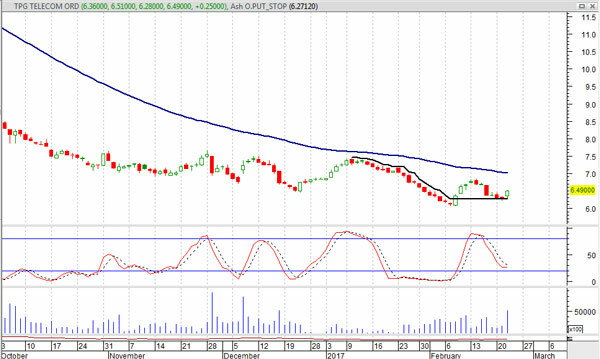 You may have been watching OZL during 2016 and noticed a nice uptrend in place.FMG comes off its uptrend, hits a turning point and starts to track back to new highs. The CFD strategy would be to use an indicator to identify the turning point. Wait for confirmation of the uptrend and take a long position in the hope of a move higher. Swing trading CFDs is when you are looking for a trade in the direction of the most dominant trend and you enter on a pullback. Most swing traders like to confirm the direction of the move before entering. So instead of getting in at the low, you wait for it to break a short-term high. The hypothetical example below is highlighting a rising three periods candlestick formation. You then place your trade, run a trailing stop loss and exit as your stop indicates. Suited to: All short to medium term traders confident with stop losses and stop to enter orders. Goal: Take advantage of intraday (within the one trading day) moves and close the position before the market closes. CFD Trading Strategy: Identify stocks with a good daily range. Sometimes referred to as the ATR (Average True Range). On open, a stock may start heading lower. It may then head back up to its opening price. Some traders like to go long when it breaks through its opening price on the day. Ride the trend using intraday pricing until your stop loss, or profit target is hit. The table below (captured on 22 February 2017), highlights the Top 10 most volatile stocks on the ASX300. Paladin Energy (PDN) is by far the most volatile, with the ATR reading showing an average daily move of 12.48% over the last 10 days. ROC1Day and ROC5Days stands for ‘Rate of Change’. How much did each stock move over 1 day and the last 5 days? You will notice the PDN chart below as well. We have highlighted the ATR reading and you will notice how volatile this stock is in 2017. Timeframe: Open and close your position within the same trading day. Because you are looking to close your position before the end of the trading session, you need fast-moving stocks. If you intraday trade and the stock barely moves, then your opportunity for profit is greatly reduced. Suited to: Experienced traders who are confident on the computer and understand position sizing strategies. Risk Level: High. The reason the risk is high is intraday moves are limited. So traders attempt to use larger position sizes to take advantage of the smaller moves. How can you lose? If you use aggressive position sizing and trade large positions on the short swings, then your potential for loss is very high. The more leverage you use the greater the chance of a large loss. The other way you can lose is if you get on trades that don’t move much. You might have 5 successive days where your positions barely move and so you keep getting out at breakeven minus brokerage. Therefore you are having a number of small losses in a row. Goal: Position yourself based on intraday information with the intent to hold for days to weeks. You work on computers during the day, have your trading platform open with your trading alerts set and when an intraday alert goes off, you position yourself in the trade. CFD Trading Strategy: Set FMG alert if price breaks resistance at $5.75. When alert gets triggered, go long 500 CFDs with a stop at $5.59. Timeframe: Intraday (if stop gets hit) to several weeks. Suited to: Experienced traders with specific entry orders and those who like to check market depth to help time their entry. Goal: You believe the market has a memory and ranges between support and resistance levels. You attempt to buy on support and sell on or near resistance levels. 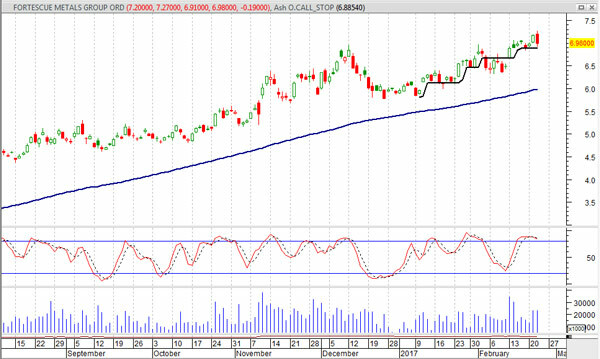 CFD Trading Strategy: Commonwealth Bank (CBA) was ranging between $71.50 and $79.00 in 2016 as per the chart below. 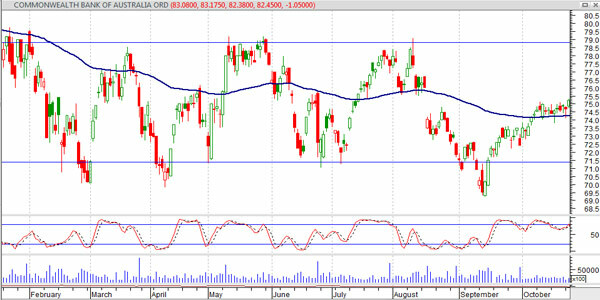 Your CFD strategy would be to buy around the $71.50 level and tighten stops up as CBA approaches resistance at 79. Timeframe: Days to 2 weeks usually. Suited to: All levels of traders. Support and resistance levels are some of the most commonly used CFD strategies. Goal: To take advantage of highly correlated shares that slip out of correlation. CFD Trading Strategy: NAB and CBA CFDs move in close unison, but you notice that NAB starts outperforming CBA considerably. You take a pairs trade by shorting NAB & going long CBA and wait for both stocks to move back into a highly correlated state. Suited to: Sophisticated traders who have access to charting software that can track two stocks simultaneously and most importantly can create formulas to track the correlation between the two positions. Goal: Monitor news items in the AFR or business section in your local paper plus websites to find volatile stocks to trade that day. Many stocks reporting news can jump 5-20% in a day. Your goal is to jump on the right side of a fast moving, emotion-driven stock. 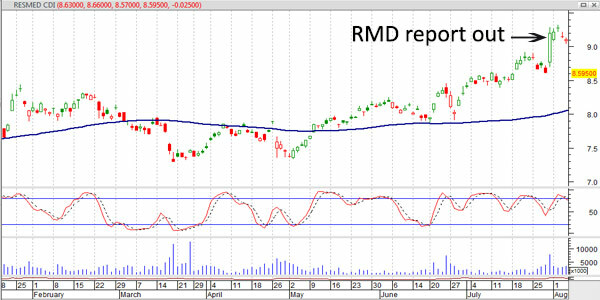 CFD Trading Strategy: On the 29th of July, 2016 Resmed (RMD) reported their 2016 results. While their revenue came in lower than previous years, their market share was growing. As a result, the share price jumped 6.8% on the day. To locate these types of opportunities, you need to watch for daily reports. On your trading platform, each stock will have an R beside its ticker if it has a report out. When you notice an R on your stock, you will need to investigate and see what it is about. Then you need to decide swiftly on whether to buy or sell. Suited to: Experienced traders with a reliable DMA price feed with reports streaming intraday. Goal: ‘Strip’ the dividend of a stock. Buy the stock before it goes ex-dividend and sell before the ex-dividend date, enjoying a capital appreciation as investors jump on board for the dividend. CFD Trading Strategy: Many stocks with an expected dividend have investors getting in early (45 days earlier to receive full franking credits). This has the effect of pushing the share price higher just before the dividend itself. Your goal is to ride the increase leading up to the dividend and close your position just before the stock going ex-dividend. Goal: Protect current share trades by taking an opposite CFD trade. This also helps to reduce portfolio volatility during wildly fluctuating markets. CFD Trading Strategy: If you believe the stock (FMG as an example) has finished its run, then instead of selling the physical stock, you short sell the CFD for the exact quantity of shares. Timeframe: days to years potentially if your stock doesn’t come out of a downtrend. Suited to: Owners of shares with moderate to high level of experience.